Paspalum paniculatum Walt Fl. Car. 75. 1788. Not L.
1759. 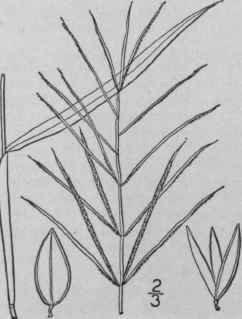 Paspalum mucronatum Muhl. Cat. 8. 1813. Ceresia fluitans Ell. Bot. S. C. & Ga. 1: 109. 1817. Paspalum fluitans Kunth, Rev. Gram. 24. 1829. Culms ascending, 6'-3° long, from a floating or creeping base, branched. Sheaths very loose or inflated, smooth or scabrous, glabrous or pubescent; blades 3'-12' long, 1/4'-1' wide, acuminate, scabrous; racemes 20-100, 1/2'-5' long, alternate or whorled, slender; rachis flat, thin, exceeding the spikelets, long-acuminate, scabrous, its margins nearly enclosing the spikelets; spikelets in two rows, 1/2"-3/4" long, elliptic, pubescent; outer scales very thin, 2-nerved, the first one usually a little the longer. In water or on mud. Virginia to southern Illinois and Missouri, south to Florida and Texas. Also in tropical America. 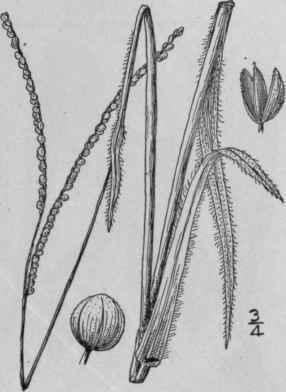 Sept.
Panicum dissectum L. Sp. PI. 57. 1753. Paspalum dissectum L. Sp. PI. Ed. 2, 81. 1763. Paspalum mcmbranaceum Walt. Fl. Car. 75. 1788. Not Lam. 1791. 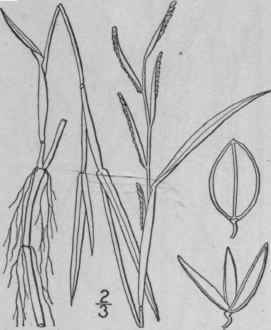 Paspalum Walterianum Schultes, Mant. 2: 166. 1824. Culms erect or ascending, much branched, smooth, creeping at the base. Sheaths a little inflated, smooth; blades l 1/2'-3 1/2' long, 2. 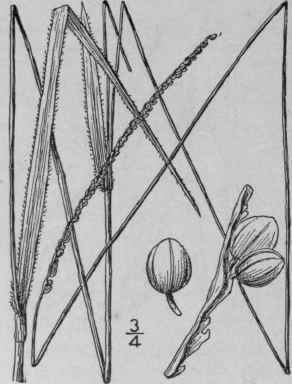 "-4" wide, flat, smooth, acute; racemes 3-7, alternate, about 1 long, the lower ones usually included in the upper sheath; rachis not exceeding the spikelets, flat, thin, 1"-1 1/2" wide, acute, smooth, many-nerved, its incurved margins partly enclosing the spikelets; spikelets about 1" long;, crowded in 2 rows, oval, obtuse, glabrous; outer scales 5-nerved; third scale lenticular, slightly shorter than the outer ones. Moist or wet grounds, or sometimes in water, New Jersey to Florida and Texas. Sept.
284. 1820. Paspalum ciliatifolium brevifolium Vasey, Proc. Phila. Acad. Stems 10'-2 1/2° tall, leafy at the base. Sheaths glabrous, excepting on the ciliate margin; blades 1'-4' long, 2"-4 1/2" wide, lanceolate to linear, glabrous, or shortly appressed-pubescent on the upper surface, ciliate along the margins and the mid-nerve; peduncles 1-2 from the upper sheath; racemes 1 or 2, 1' - 3' long, more or less curved, the rachis very narrow, more or less flexuous; spikelets in pairs, about 3/4" long, broadly obovate, the first scale 3-nerved, glabrous, the second 2-nerved by the suppression of the midnerve, glabrous. Sandy soil, North Carolina and Kentucky to Florida. Aug.-Sept.
Paspalum stramineum Nash, in Britton, Man. 74. 1901. 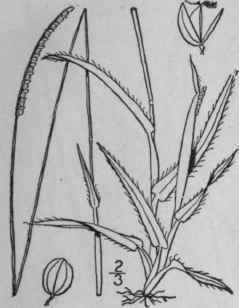 A tufted branching perennial, with light yellowish green foliage, flat leaf-blades which are appressed-pubescent on the upper surface, and usually pubescent spikelets; culms 8'-3° tall; leaf-sheaths glabrous, excepting on the ciliate margins, the basal ones softly and densely pubescent; blades firm, erect, linear or lanceolate, with a few scattered long hairs in addition to the shorter pubescence on the upper surface, long-ciliate on the margins, 10' long or less, 2 1/2"-5" wide; racemes 1 1/2'-4' long, on the main culm usually 2; spikelets in pairs, orbicular, about 1" in diameter, the first scale 3-nerved, pubescent with short spreading glandular-tipped hairs, or sometimes glabrous, the second scale glabrous or nearly so, 2-nerved by the suppression of the midnerve. In sandy places and fields, Nebraska and Missouri to Texas. Aug. and Sept.